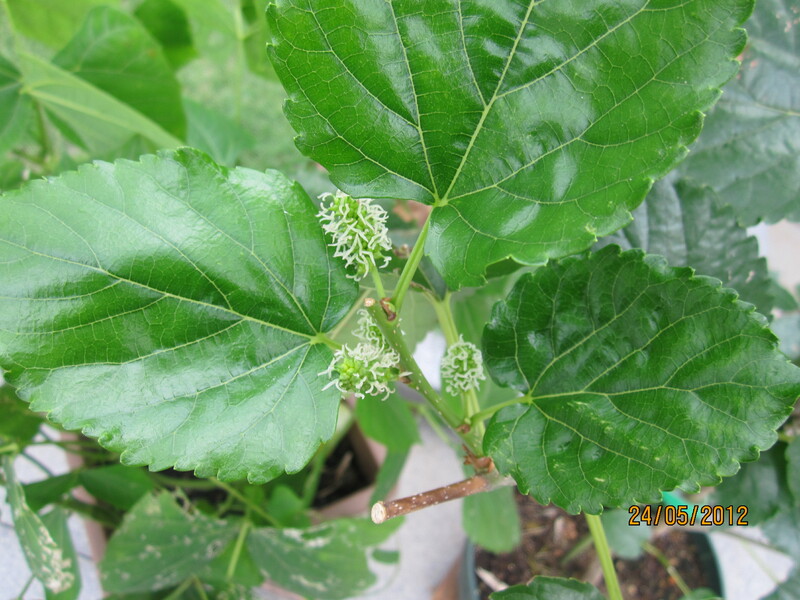 I have posted about Novice Gardener’s mulberry plant before, especially about how it started sprouting fruit everywhere. Anyway for a while it did very little and Mummy was eyeing it. It behaved just like me when I don’t finish my homework and Mummy gives me the evil eye. It produced lots and lots of fruit, just look! 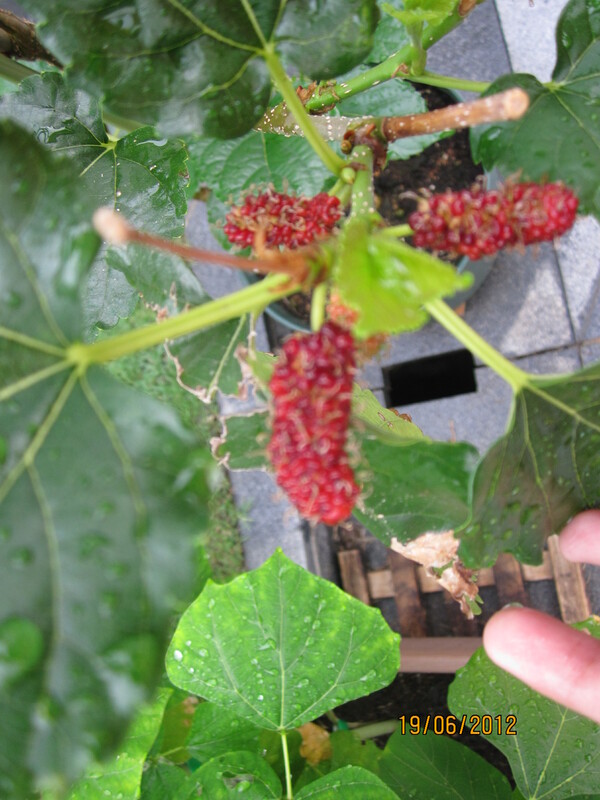 There are mulberries all round my mulberry bush, and they are getting redder and redder. 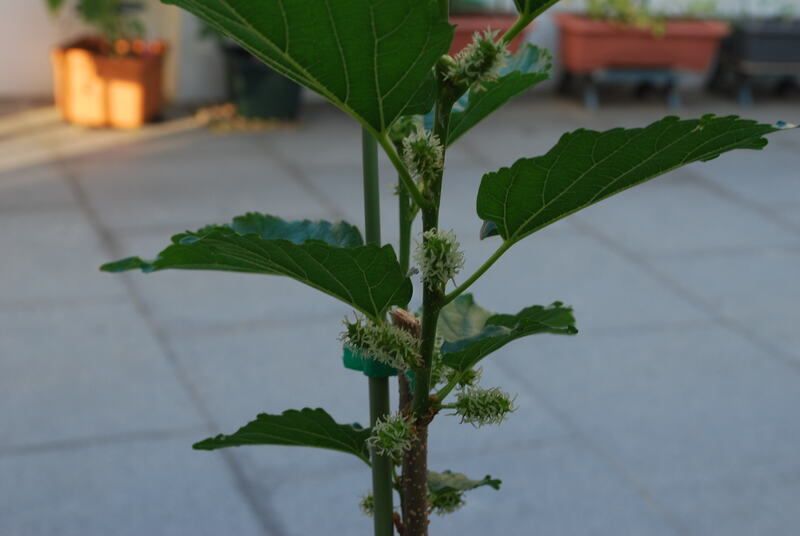 Remember my mulberry that had a reprieve from adoption? 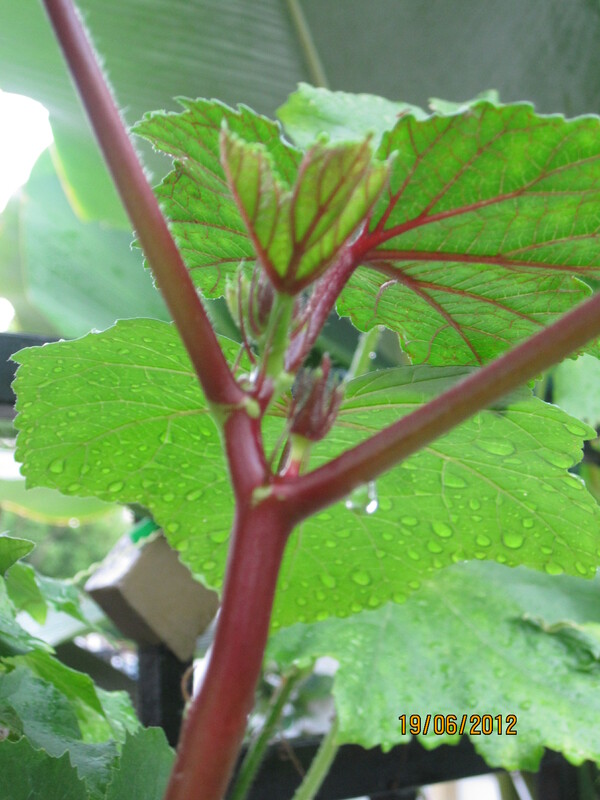 We followed Novice Gardener’s advice. She said, prune savagely. Mummy says her brother prunes human arms and legs, so she probably learned from him? 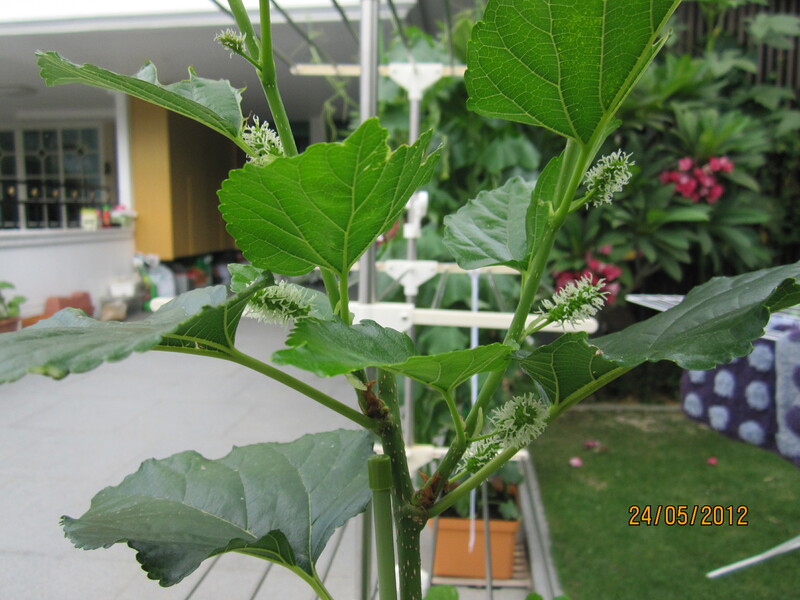 For my mulberry with fruit is festooned! 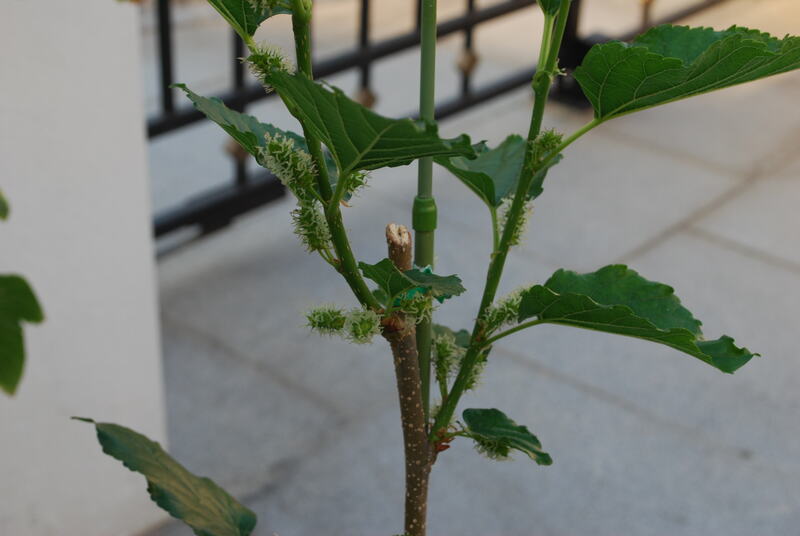 From the Mother Weed: Our mulberry plant has been living on the edge. 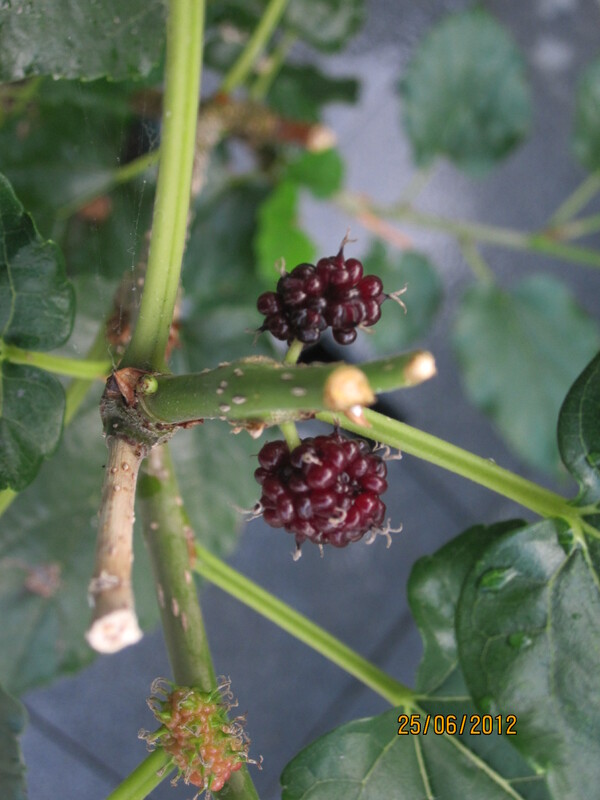 The pruned (as advised by Novice Gardener) mulberry plant was loaded into our car, to be delivered to a high-rise friend. At the eleventh hour, a long-faced Weed came downstairs to plead for clemency, on grounds that it had one fruit. Since I was reminded that pregnant women cannot be put to death (well, not before they deliver the baby), I was obliged to unload the wretched plant. 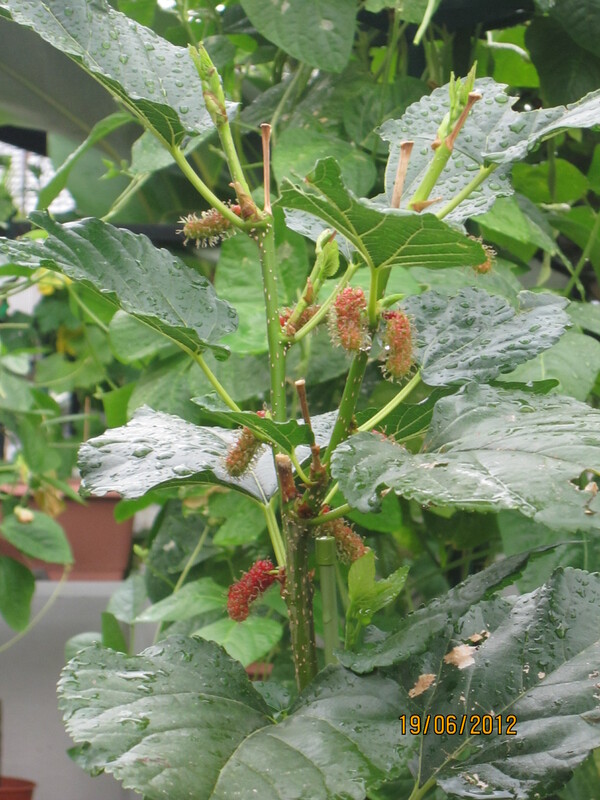 I fully expect that the sole mulberry will be eaten by birds tomorrow. Before you tell me what a kind, good-natured child the Weed is, let me finish the story. 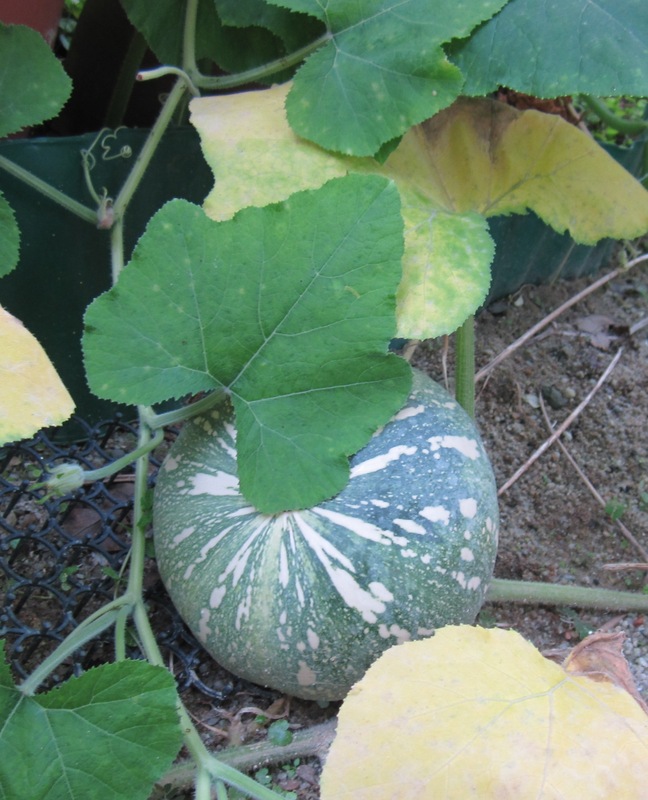 4 hours after the mulberry had its sentence commuted, he was merrily in the garden with a pair of kitchen scissors, dissecting the useless Far East Flora pumpkin vines, without a sigh of regret. So much for waiting til 10 May which was the set execution date. 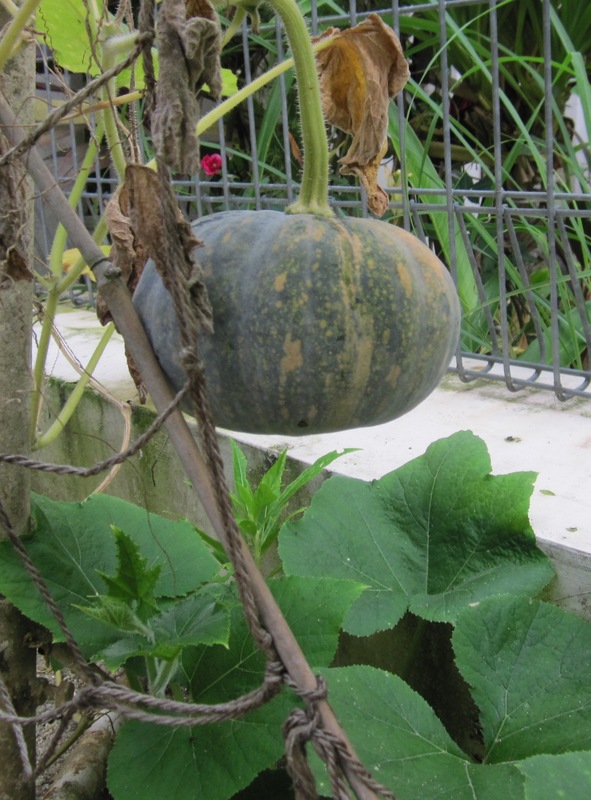 Amnesty International for Pumpkins would be picketing outside our house! 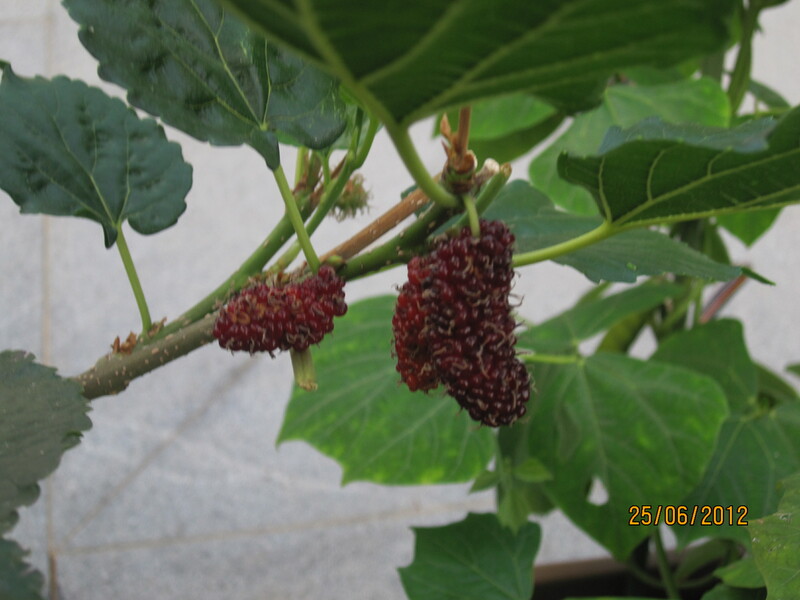 Mummy wants to give away the mulberry bush that Novice Gardener gave me. 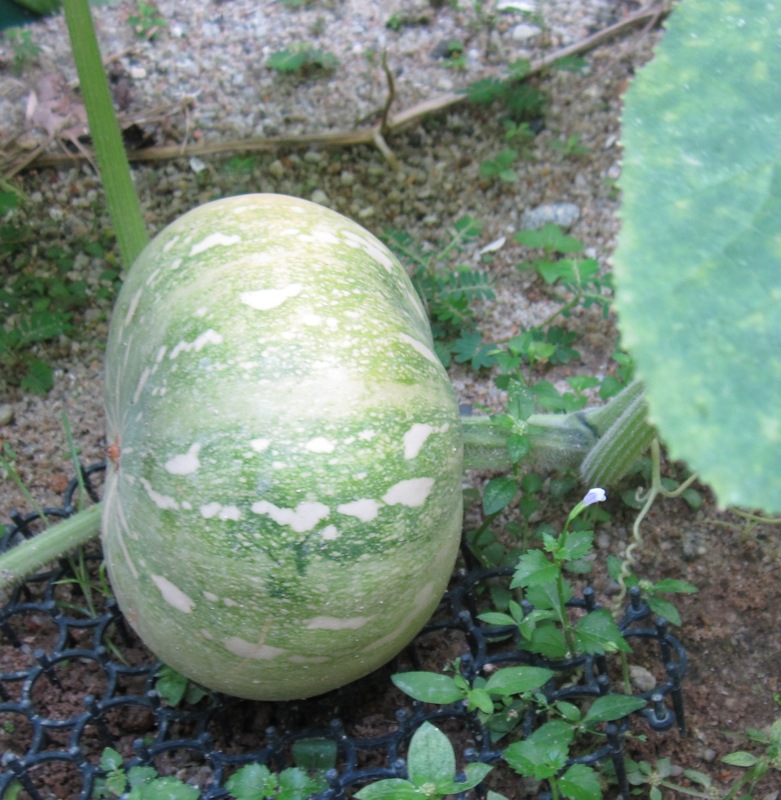 She says it’s not producing any fruit and is wasting space in the garden. 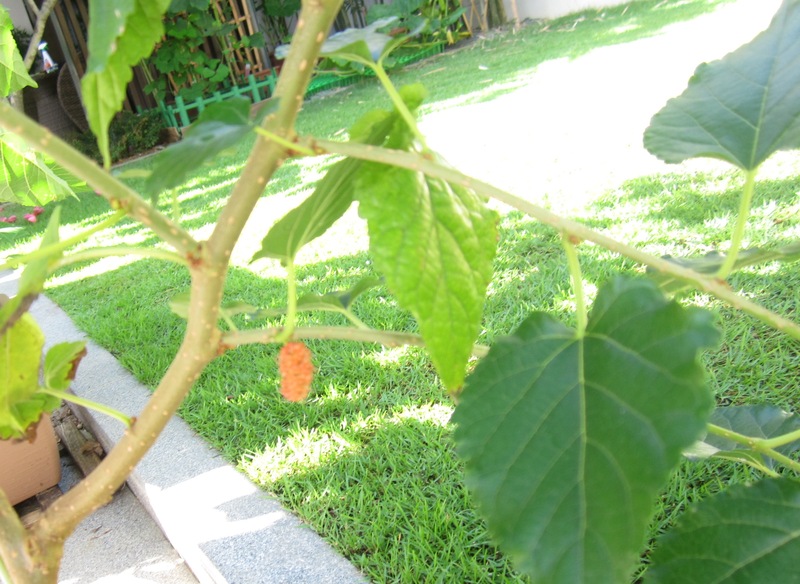 Anyway the mulberry is trying to save itself – see the one fruit it produced? Sorry, I think I forgot macro again!